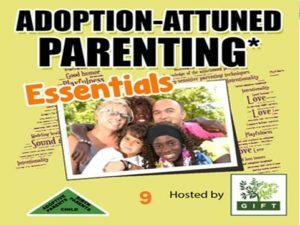 Today, as part of our observance of National Adoption Month, Growing Intentional Families Together (GIFT) debuts our newest resource for adoptive families: a weekly 15 minute podcast-- Essentials for Adoption-attuned Parenting*. Listen to learn practical tips for building and strengthening your family. Podcasts will air for approximately 15 minutes. (They'll be concise and to the point so you can easily squeeze it into your busy schedule!) The coaching and discussions will focus on real situations confronting adoptive families. Available on i-Tunes. How often have you yearned for support from someone who understands adoptive family life who doesn't judge you or your child for the struggles that you face? Wait no longer. Sample the free series. Discover how it might help you and your family. Hear how other families handled similar situations. Experience a sense of judgment-free community, possibility, and hope. 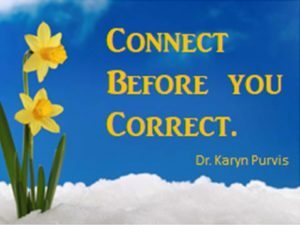 Joann DiStefano and Susan David have developed these podcasts using coaching principles and a healthy, relational adoption philosophy that views adoption not as a one time experience but a lifetime journey. They look forward to its launch and to connecting with our listeners. 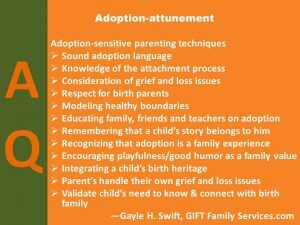 GIFT Family Services has consistently advised parents to commit to Intentional Parenting and to develop a high AQ* (Adoption-attunement Quotient* ) because we believe Adoption-attuned* advice and methods best suit adoptees and their families. 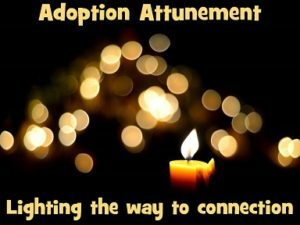 This acompanying graphic summarizes the Adoption-attunement* approach. Copy and save it for future reference.